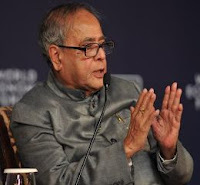 The Finance Minister Pranab Mukherjee welcomed the Reserve Bank of India’s (RBI’s) pause from its rate tightening cycle in its mid-quarter monetary policy and also remained hopeful that inflation would calm down further in coming weeks. “The need to improve the business sentiments and recover the growth momentum in the remaining months of the current fiscal necessitated a review of the monetary policy stance.I believe that inflation will moderate further in the coming weeks and, therefore, the announcement today is welcome,” Mukherjee said. The RBI, in its mid-quarter monetary policy review, kept its repo rate and reverse rate unchanged, because of the slowdown in economic activities. The RBI maintained its lending and borrowing rates at 8.5% and 7.5% respectively. The central bank also surprised the market by keeping Cash Reserve Ratio unchanged, amid broad expectations of a cut in the rate. The decision of not increasing interest rate has been welcomed by the industry and policy makers. Experts are of the view that the anti-inflationary monetary policy stance adopted by the RBI has been affected the growth rate. The Indian economy is going through tough time; its economic growth in second quarter of 2011-12 fell to 6.9% compared to 7.7% in the April-June 2011. Industrial output also fell to -5.1% in October 2011.